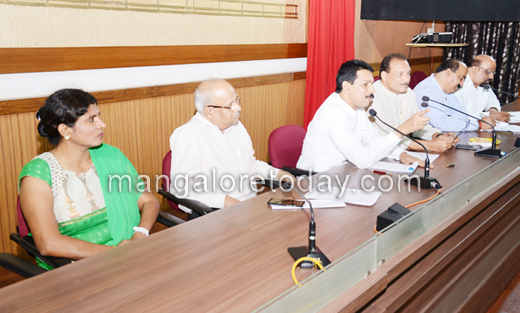 Mangaluru, May 19, 2015: Chairing the divisional railway review meeting at Zilla Panchayat auditorium on May 18, Monday. 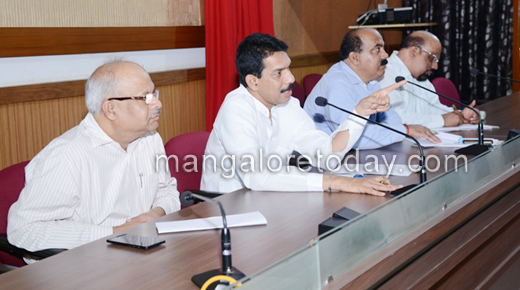 MP Nalin Kumar Kateel has given an ultimatum of May 28 to the MCC- Mangalore City Corporation engineering section to finish the shifting of utilities to make way for Padil railway under bridge construction work. At the meeting, railway officials alleged that stagnant water is a serious problem and the corporation should shift the utilities and plan for concretising. The MCC official said they have shifted the pipeline and 11kv power cable will be shifted within 10 days. The MP and MLC Ivan D’Souza, who is also Southern Railway Consultative Committee Adviser, were unhappy and wanted the officials to finish the work by May 28. On land acquisition near Mangaluru junction railway station to convert it into world class station, the railway staff said MCC has completed only 27 per cent of survey. However, consultant said though survey is almost completed, MCC neither checked nor proposed. Payment is also due. MCC Joint Commissioner Gokuldas Naik promised providing their proposal soon. Railway officials said Mangaluru intercity train would not be profitable idea. Already Madgaon-Mangaluru train was running with 50-60 passengers against 350-360 capacity. Nagarika Seva Samiti President G Hanumanth Kamath said it was because of trains from Goa arriving in morning. Bengaluru- Madgaon train can be delayed from 8 am to 9 am. MP nalin came down heavily against city corporation on drainage leakage problem in employees’ colony near Muttappa Temple of Mangaluru central railway station. MCC official said two works tenders have been passed. The work is quite difficult as sewage passes through their infrastructure. For Jeppu Mahakalipadpu Railway under bridge project, MCC has released Rs 30.9 lakh. However, Rs 21 crore project needs more money along with funds from railways. MLC D’Souza, directed handing over of proposal to him to get funds from State government. The Kankanady-Nagory approach road is pending, officials informed they would complete it using premier Floor Area Ratio (FAR) funds. On Thokur bridge, the MP sought a joint survey and report to MLC Ivan D’Souza. 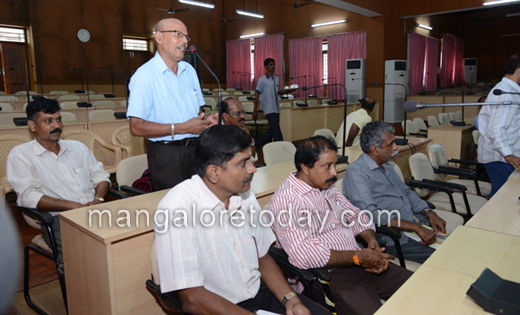 Regarding extra platform at Mangalore central, Palghat Divisional Railway Manager Anand Prakash said no additional platforms have been sanctioned. Meanwhile, railway said whenever Dakshina Kannada district administration sends a candidate it is ready to train him and appoint as for ticket counter of DC office in Mangaluru, now not in operation. MP Nalin Kumar said the Centre has sanctioned Rs 6.30 crore for various development works in railways for district. Escalator work at Mangalore central railway station would be completed by October, however officials said they can provide lift facility within one month. The MP visited various places including Kulashekara where residents demand for underpass and to Padil. MP Nalin Kumar Kateel said a complaint section would be opened in his office and MLC Ivan D’Souza’s office and problems related to railways taken up as in ’Adalats’. People can submit their complaint in the section at any time, he said. The MP said the review meeting of railways would be convened within 20 days. He directed MCC officials to be ready with information about railway projects and files related to approach roads towards railway stations, requirement of funds for new projects and other details. The public too needs to know when these meetings are scheduled, or else there is little or no use.